For building applications targeting .NET 4.7.1 download the Developer Pack. You can see the complete list of improvements in the .NET Framework 4.7.1 release notes. .NET Framework 4.7.1 reference sources are available on the GitHub .NET Reference source read-only repository. .NET Framework 4.7.1 will be available on Windows Update in the near future. Docker images will be made available for this release and we will update this post when available. Applications that target .NET Framework 4.6.1 through 4.7 must deploy additional .NET Standard 2.0 support files in order to consume .NET Standard 2.0 libraries. This situation occurred because the .NET Standard 2.0 spec was finalized after .NET Framework 4.6.1 was released. .NET Framework 4.7.1 is the first .NET Framework release after .NET Standard 2.0, enabling us to provide comprehensive .NET Standard 2.0 support. Refer to the following sample to leverage this new feature. In previous versions, if application code specified a System.Messaging HashAlgorithm value, it was limited to MD5 and SHA-1. With .NET Framework 4.7.1, there is support for HashAlgorithm values for SHA-256, SHA-384, and SHA-512 added to System.Messaging Message.HashAlgorithm. The actual usage of these values is in MSMQ as MSMQ makes the “default” decision and these values are simply passed down to MSMQ. System.Messaging does not do any hashing with these values. Following snippet illustrates how you can enable hashing on a queue and create a message with these new values. Configuration builders allow developers to inject and build configuration for applications at runtime, allowing configuration data to be pulled from sources beyond the traditional .config file. In previous versions of the .NET Framework, configuration has been static. Applications only draw configuration data from a limited chain of .config files. With Configuration Builders, applications can apply a custom-defined set of builders to any section of config. These builders are free to modify the configuration data contained in the given config section, or build it entirely from scratch – possibly drawing new data from new sources that are not static files. To use the Configuration Builders feature, developers simply need to declare builders in config, then apply them to configuration sections with the ConfigBuilders tag. To implement custom Configuration Builder, developers can inherit from the System.Configuration.ConfigurationBuilder base class. Here are some code samples that will enable you to declare, use and apply configuration builders. ASP.NET processes requests in its predefined pipeline which includes 23 events. ASP.NET executes each event handler as an execution step. With this new ExecutionStepInvoker feature, developers will be able to run this execution step inside their code. Today ASP.NET can’t flow the execution context due to switching between native threads and managed threads. ASP.NET selectively flows only the HttpContext which may not be sufficient for ambient context scenarios. With this feature we enable modules to restore ambient data. The ExecutionStepInvoker is intended for libraries that care about the execution flow of the application (tracing, profiling, diagnostics, transactions, etc.). Check the following sample to leverage this new feature. The following sample illustrates the usage of this new API. At runtime the check for feature support is done by calling a static method. This is enabled by the addition of the framework type RuntimeFeature. Tools can query it by calling the static method bool IsSupported(string) to check whether the feature is supported or not, by passing in the string name for a given feature. For example, RuntimeFeature.IsSupported(“FixedGenericAttributes”). Applications that target the .NET Framework 4.7.1 or later and want to preserve the legacy accessibility behavior can opt in to the use of legacy accessibility features by explicitly setting this AppContext switch to “true”. Detailed information on all the Accessibility changes are provided in the .NET Framework 4.7.1 Application Compatibility documentation. One of the key improvements in SvcConfigEditor.exe is the new Diagnostics screen. In previous versions of SvcConfigEditor, the Performance Counter toggle link had no way of displaying which options where available. It was unclear how to enable and/or disable features, and keyboard navigation was limited and unpredictable. 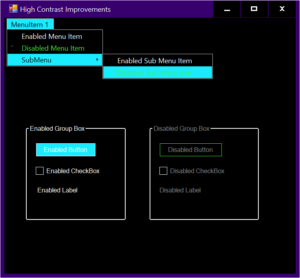 Since most of the GUI design was based on labels without action controls, screen readers failed to read and highlight the items correctly, and labels with colors not compatible with different high-contrast settings where abundantly used. In previous version of SvcConfigEditor.exe, focus order in “Edit WCF Configuration” window is inappropriate, they are now in more logical focus order. This feature provides a number of ways to control the VisualDiagnostics features. Diagnostic assistants can request WPF to share internal information. This feature gives both the assistant and the application developer more control over when this sharing is enabled. Please try out these improvements in the .NET Framework and let us know what you think. Please share your feedback in the comments below or on GitHub. Why don't you publish Git tags in https://github.com/Microsoft/referencesource?. That way it would be easier to determine the right version of the sources for inspection/debugging.